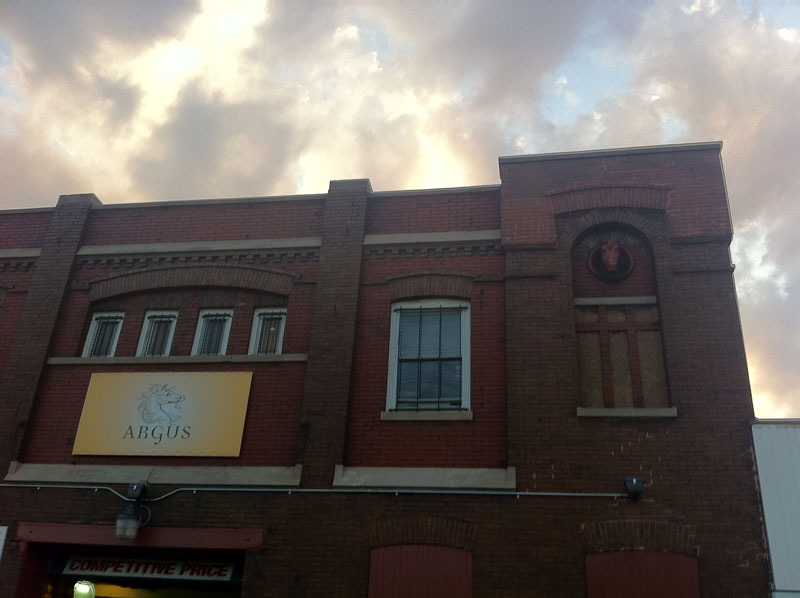 Hidden away in the historic Pullman District of Chicago is a growing brewery that many of you may not know about, Argus Brewery. 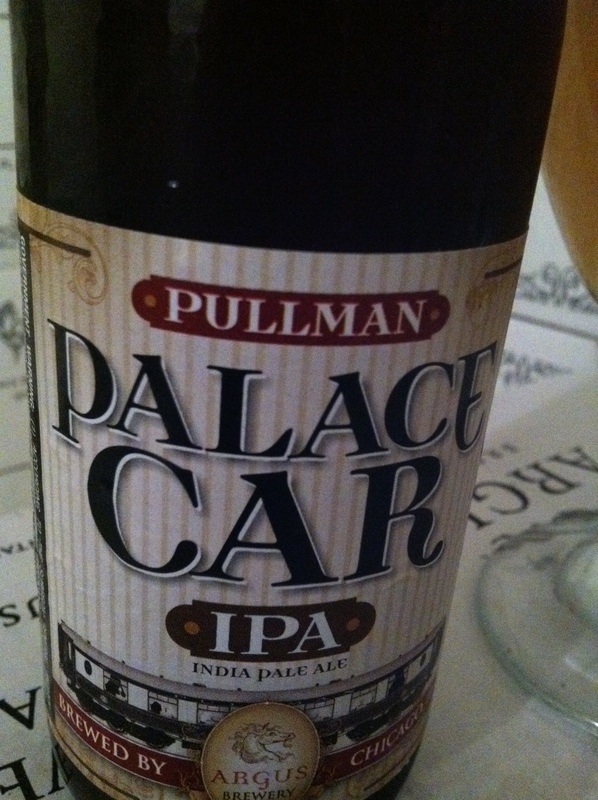 Well this is about to change as this 2 year old brewery is carving their way into the Chicago beer market. 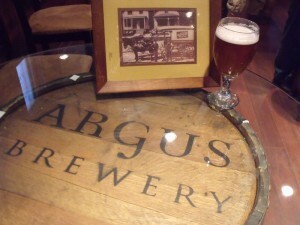 The Argus Brewery itself has a bit of history behind it even before they existed. The brewery is located at 11314 Front Ave, and is only 1 of 2 surviving “Schlitz Row” Commercial Buildings. The building was designed by the historic architect firm of Frommann & Jebsen who designed many of the Schlitz Row buildings. It was built in 1906 as a stable to house the horses who pulled the Schlitz delivery wagons. 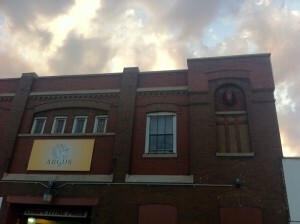 So with some brewery history behind them, Argus begun brewing beer in late 2009. 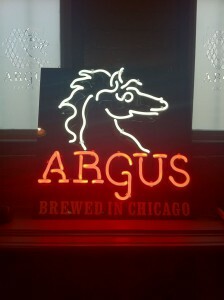 Taking the name of the all seeing Argus in Greek Mythology and the logo from the historic horse head sculptures that adorn the brewery building, they began seeking out distributors and being a new brewery without an established base they were quick to dismiss them, so rather then give up they searched out a market that would embrace them. This turned out to be the restaurant market. They began to brew and self distribute to restaurants as Black Dog Distributing which was named for the founders dog Bandit. Starting with their first brew McCaffreys Irish Creme Ale brewed for Ballydoyle Irish Pub, and then expanding with more selections for other restaurants. Starting out with 4 10 barrel fermentors and now having an additional 6 20 barrel fermentors in the line-up, they have expanded the selection of brews and begun bottling. 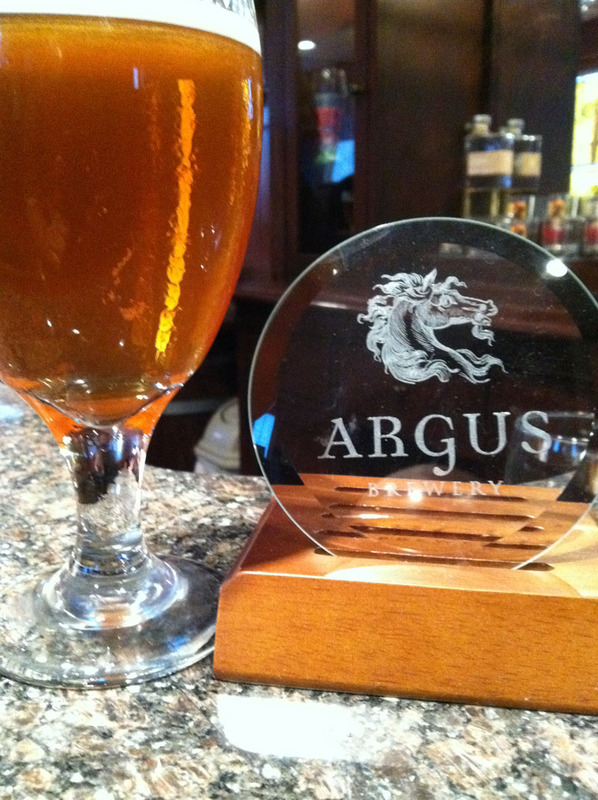 So now you can enjoy your favorite Argus brew while enjoying a relaxing evening at home. With the 2 year anniversary coming up a limited release London Porter is planned for bombers, so look for this coming this fall. 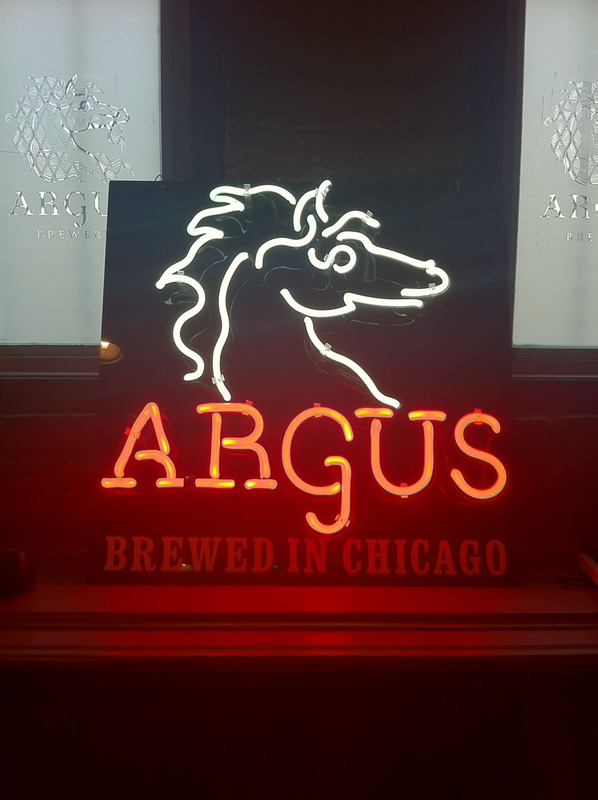 In the 2 years they have added many new beers to the Argus line-up including my favorite Pegasus IPA which the recipe was purchased from Smugglers brewpub in Telluride, Colorado. After reading so far you may be wondering what happened on our visit, well a good portion was discussing history and the beers, so what I’ve talked about so far was a good part of the tour. We arrived outside the Argus building and were greeted by Joe Mengel VP of Sales. 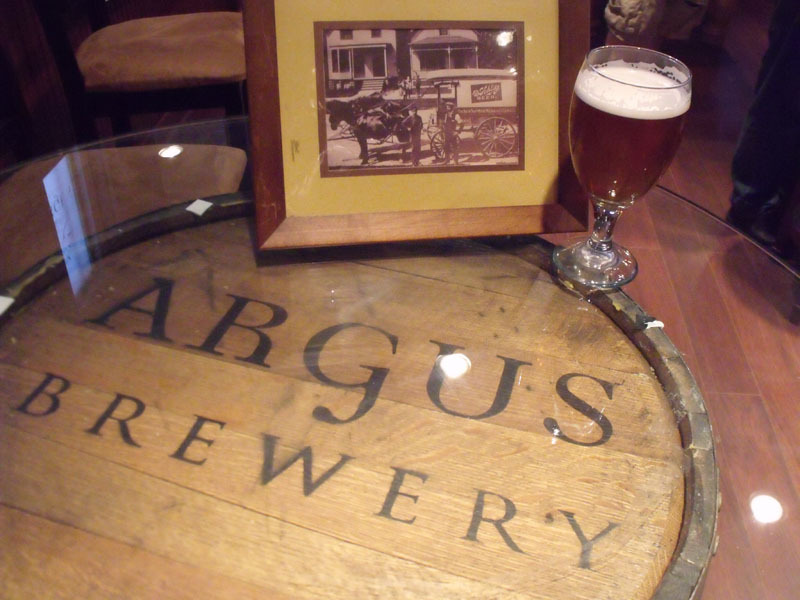 He welcomed us into the brewery, and as we waited for others to arrive we started enjoying a glass of the beer that started the Argus story, McCaffreys Irish Creme Ale. Soon after Bob Jensen Founder, Patrick Jensen Co Founder, Nick Lubovich Community Relations Sales Manager joined us. Bob’s wife Debbie also arrived with plenty of snacking food from her favorite deli to ensure we would be able to sample all the brews we wanted without having an empty stomach. We then began the tour throughout the building even enjoying a ride on the old elevator that was used to transport the horse and carriages from one level to the other. This now comes in handy when adding more large brewery equipment like the fermentors. 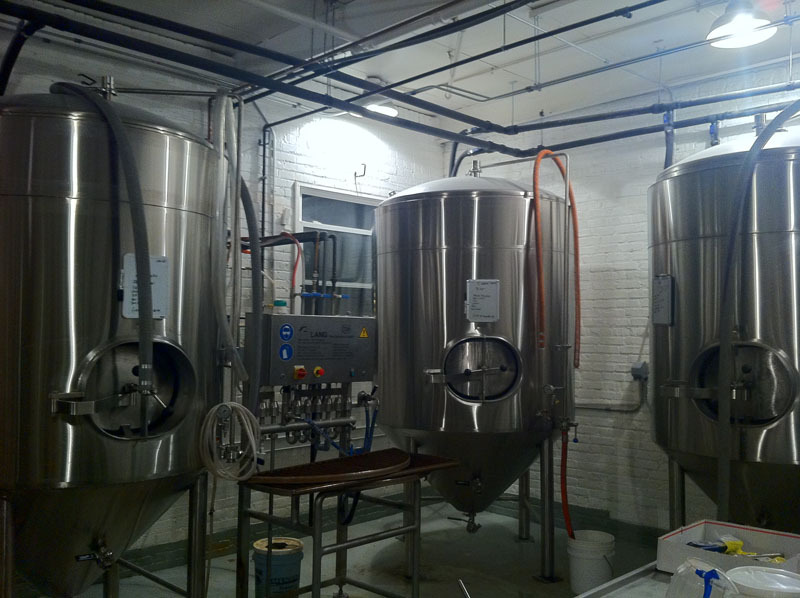 The entire brewing operation is on the second floor, while the first is mainly bottling and cold storage waiting to be shipped out to customers. With expanding their bottling they have recently hired directly from the surrounding community to provide jobs. While being a smaller brewery it may seem like a small thing just a couple new jobs; however, this shows Argus’ commitment to the community they are in. Heading back up to the tasting room to grab a few more brews before we called it a night. 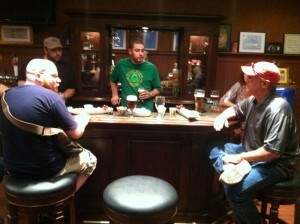 Topping off the night we tried 2 versions of a Rye Wit that were brewed as test batches. I am not typically a wit drinker, but both versions were well balanced and something I can see myself drinking regularly. The consensus was that version 1 was the way to go, so with our input hopefully we will see that hit taps and bottles sometime soon. We then said our thanks and headed home. Argus admits that many of its brews are marketed as gateway beers to help the masses move into the craft beer world, and I know some of the craft beer world may find this a turn off. 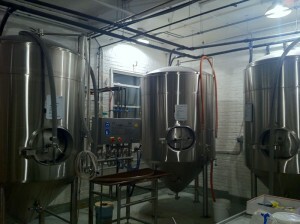 Don’t discount Argus, they are a great local Chicago owned and operated brewery with great beers. From the main offerings which fit the gateway beer category which should have a place in any beer geeks fridge, to the other experimental beers that I foresee them coming up with in the future. 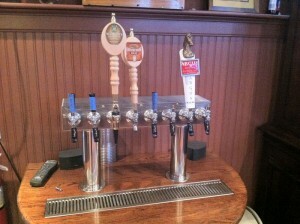 I think in the future they will have even a bigger selection of beers spread over the entire craft beer spectrum. 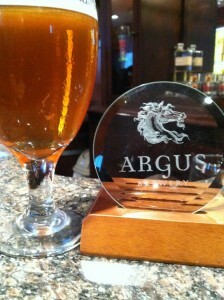 Argus is a brewery to watch and I believe you will start to see them showing up at more and more locations over time. 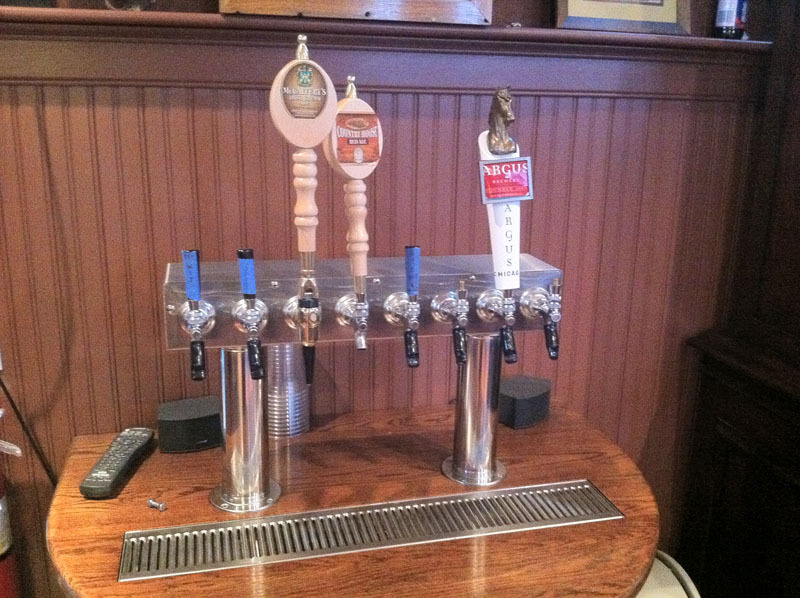 Arugs Brewery, Ballydoyle, McCaffreys Irish Creme Ale, Pegasus IPA, Pullman, Schlitz. Bookmark. Awesome post! I admit that I have often overlooked Argus when I have seen 6-packs in the store. I think it is time for me to pick one up! Thanks for the insight! I have a rule that I dont leave town between May – August because summertime is so active around these parts. Chicago and many of the surrounding towns have such history and personality that rediscovering them makes for a vacation without leaving. The Jensen Family embody everything love of about the southside…tradition..passion..pride…I hope that more craft breweries..explore classic south of downtown neighborhoods like pilsen, bridgeport, hyde park and beverly it would be great for the city. I like the Argus approach making beers that are sessionable enough for the casual craft beer fan to enjoy. The tour was great, it was cool to see photos of the Schlitz Horses that occupied that space…hear stories about how Cottage Grove was built, see stock options from the turn of the century and just be in the same building as the team that was once the largest distributor of beer in the world! kudos to Dan on very nice write up.